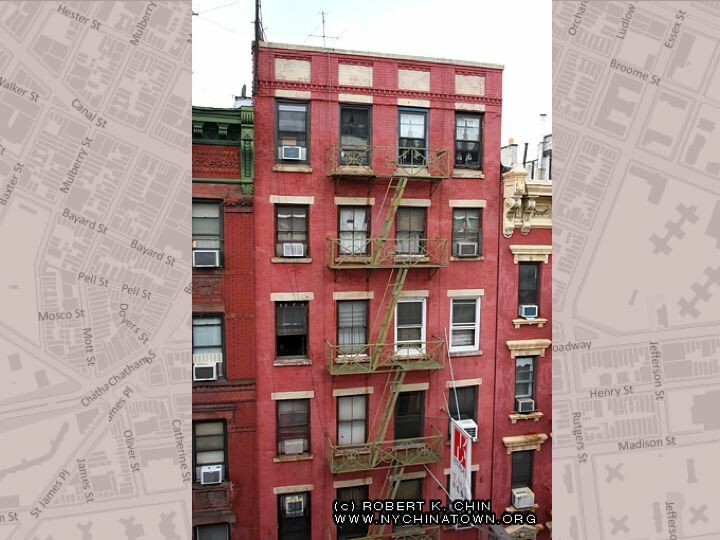 The oldest existing tenement is also one of the tallest and may be the first tenement as well, 65 Mott Street in the heart of the NY original immigrant ghetto Five Points neighborhood which is today Chinatown, seven stories, built around 1820. It's something of a puzzle. All the other tenements from 1820 to around 1880 are only five stories tall. I once asked Tyler Anbinder, the great authority on Five Points, why it is so tall. He responded candidly that he didn't exactly know, but maybe it wasn't originally seven stories and was later expanded. I asked him then why tenements weren't built seven stories back then. Again candid, he suggested that he could only imagine that seven stories, given the architectural materials or methods, would have been unstable. I've asked at least one other historian who gave pretty much the same answer -- it couldn't have been originally seven stories. And I'm pretty sure they are wrong. Here's why. First, there was at least one other building seven stories tall built even earlier -- five stories and two stories of attic -- the Rhinelander sugar factory that was built up on the hill that City Hall and the Municipal Building stand on. (One window of it has been preserved with a plaque.) Later in the the early 19th century it was expanded to eight stories. 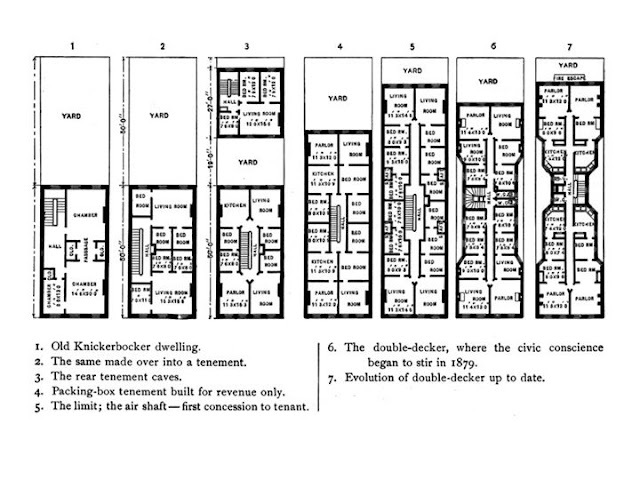 So it was possible to build sound seven story buildings in 1820. More obvious, the 65 Mott still stands today, so whether the seven stories were an expansion or original, the original was perfectly able to support seven stories. There aren't even any structural supports that you occasionally see in old buildings. It was and is sound. That's #3 above. The 1879 law would have required more window space than the building offers. 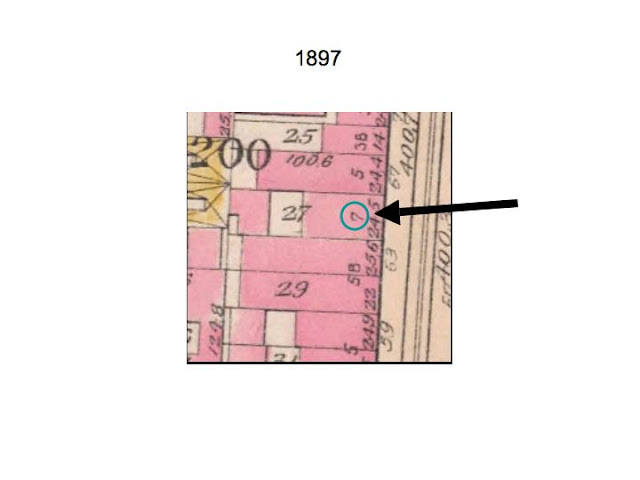 So if it had been expanded, it would have been expanded prior to 1879, when, again, buildings were only five stories. So if expansions to seven stories wouldn't happen until after 1879, and its current structure could only have been built prior to 1879, how did it get to be seven stories? To answer this dilemma, consider a new market, like the dot.com boom. When a new market first appears, it bursts into a frenzy of speculation. Not everyone jumps on the band wagon, but some people do. Remember that the landowners did not build on their land themselves; they contracted with entrepreneurs who were looking to make their wealth on the rental market. In 1820, suddenly there was a new rental market, not houses, but multiple dwellings for the surge of immigrant cheap labor. To cash in on poverty, volume is always essential, since the immigrants individually have limited disposable income. Now consider such an construction-rental entrepreneur. He has, say, one lot to make his way to wealth. There's a new market the potential of which no one really knows. No one really knows how much rental space the market will bear. But since the immigrants keep coming, the demand seems unlimited and not likely to stem. Our one-lot entrepreneur makes a fully rational decision to build as high as any building has been built -- the steeples of churches except -- as high as the sugar factory. In a way, it's a crazy scheme. Who will climb six flights of stairs? Certainly not the gentry. That's one reason why townhouses and business establishments were only four stories -- and the fourth story of a town house was for the house servants. Only immigrants would be expected to climb three flights. But the tenement house was for immigrants. Even the six flights of stairs of the Sugar House, after all, was only for immigrant labor. So our ambitious contractor builds to the max. Just one problem. Lots of other entrepreneurs also have the same idea, building similar structures. And as he tries to rent out the top floor, he finds that the market has already shifted. Supply has increased and the marginal value of a sixth floor has collapsed. The only people who will rent there are the most desperate of the poor, only the most undesirable. Instead of becoming a source of wealth, the top two stories become a lesson to the contractors: the market will sustain only five stories. And so the structure remained the tallest residential structure in New York City from 1820 to around 1880. And the construction market remained five stories with this one and only exception, the lesson of a bubble speculation, and an early if not the first tenement built. That five-story market didn't change until the Eastern European and Italian immigration in the 1880's, when to accommodate the increased demand suddenly the tenements bumped up to six stories, where it remained until just before the New Law in 1901. 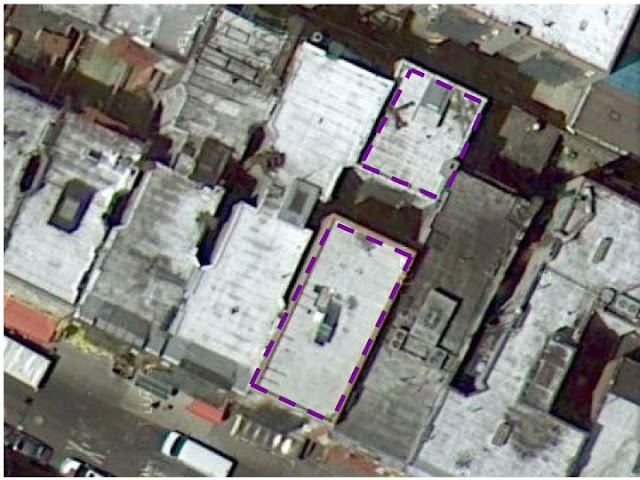 At that moment, you'll see a few seven story structures built an the assumption that the neighborhood will continue to grow more dense, and since the New Law would require less density -- less rental space-- small lot owners would build on speculation, to build more densely prior to the law. Ironically, a few decades later, the subways took the density out of the neighborhood, and now those seven story walk-ups are the legacy of another speculative promise that never happened. As an addendum: The building no doubt was modified to comply with various laws over the years. The roof seems to have been modified to add a stairwell bulkhead and the brick above the top floor lintels don't look original either.